These words clarify the way to a carefree, joy-filled and peaceful life. Walking in beauty means to look at all you see with your heart and mind. This might mean to see beyond the surface appearance of disharmony and know there is perfection and beauty within a situation. There is beauty all around you and sometimes it takes a prayer such as “let me see the beauty here, God,” to make this apparent. Walking in beauty means to allow the awareness that there is beauty in this world to bubble to the surface, so you can be conscious of the great beauty of God’s creation. One flower holds as much of the key to universal knowledge as does the whole field of flowers. Do all you can to be aware of the beauty around you and to bring more beauty into your world. Bringing that one flower into your home can brighten the day, as the spiritual essence in that flower permeates your world. Look for beauty every day and be grateful for what you find. Living in trust means that deep within thee is an inner knowing that you are never alone, and that God’s will is working for you in your life. As you give your life to God and pray that God’s will be done, you can trust in the appropriate outworking in every situation for the highest good of all concerned. Living in trust means accepting what is apparent in your life, and making a claim for God’s will which is inherent in every situation. 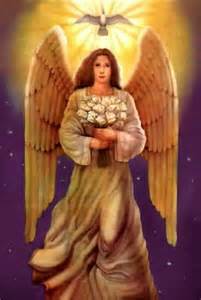 Living in trust allows the Angels to comfort and inspire you so you can receive support in every area of your life. When you know the benevolent love of God guides your way, there is a beacon of light to follow. This love is the most powerful force for good in the universe. This love creates peace and harmony in the heart and soul of each person who remembers. Allow faith in this statement to permeate every cell of your being. You are always guided by God’s love and you are never alone. You can call on this love at any time and know truly it is there for you. So allow this statement to become your way of life. Belief will create more love, joy & peace for you in every way. This entry was posted in * AGE - OF - AQUARIUS, * ANGELS - AWARENESS, * ARCHANGEL MESSAGES, * ASCENDED MASTER INFO, * ASCENSION - AWARENESS, * AVATAR ANGEL WORK, * COMPANY OF HEAVEN, ARCHANGEL GABRIEL, ASCENSION "TOOLS", ASCENSION - HUMAN, BIBLE - GREAT PRAYERS, COUNCILS OF ELDERS, Guardian Angel - GUIDE, MANIFESTING DESIRES, SIGNS AND WONDERS, SPIRITUAL Information, Spiritual Lessons Growth, The Godhead Messages. Bookmark the permalink.